A 2-1 overseas series win opens more questions for India, than answers! 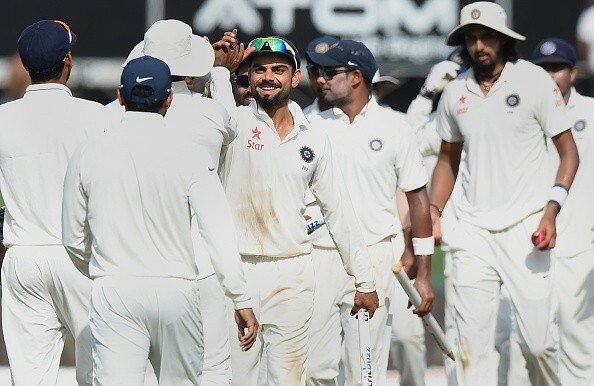 Virat Kohli & Ravi Shastri’s much (self) touted aggressive India have won a series in Sri Lanka after 22 years. While the hosts are deep into a rebuilding process, the win is moderately credible as India too are rebuilding. To put it in perspective, Pakistan recently beat the Lankans in the island nation in all formats of the game. What used to be a fortress in the 90s and 00s can now easily be breached. If not for one Dinesh Chandimal innings, this series was supposed to be a stroll in the park 3-0 win for India. However the series will now be remembered more for individuals – some in positive light, some not so. Is Harbhajan Singh’s career over? Has Amit Mishra got his mojo back? Was Pujara ill handled? Was Rohit given too much comfort? Was Rahane left confused? Has Ishant finally come of age? Is Ashwin’s batting good enough for the team to play five specialist batsmen? Is Binny good enough at this level? It’s fascinating that an overseas Test series win actually has cropped up more questions than answers. Here’s a look at India’s conundrums and if there are solutions. Is Pujara our fourth choice opener? Or third choice one down player? All said, at 180/7 on day one at Colombo, Cheteshwar Pujara played the series-defining innings – if not for that innings, this series would have been comprehensively lost. The obsession of fitting Rohit into the playing eleven has had its victims, Pujara being the biggest one. His form over the past six months with Saurashtra, Yorkshire and India A have been average. But for a player with immaculate defence and cut out for serious Test cricket, is it worth treating him like loose change or just let him grow into a Test specialist at one down? Is Rahul worth the effort? Seven single digit scores in ten innings define Rahul. Half a dozen dropped catches at slip too, amidst a few good ones taken. The Rohit-Rahane-Pujara musical chairs is taking a lot of heat out of the inconsistency shown by all our batsmen. In every innings only two to three batsmen are putting their hands up â€“ a trend started from the Australia series late last year. Rahul played one good innings this series and had five failures. At best he is a decent backup opener, and even that’s not certain. Are our fitness certifiers good enough? India have the habit of carrying unfit players. This time Varun Aaron and Murali Vijay look the suspects. In between a tightly contested series, Dhawan and Saha got injured. No one knows the truth – who was carrying, who was hiding- but the medical staff are paid megabucks to ensure only fit players make to the squad. Have we got them right? Has Mishra sealed the second spinner’s slot? Lack of choice, best strike rate, best economy rate and only second to Ashwin in wickets this series, make “Mishi” an automatic choice in playing eleven for the upcoming home season. That he chipped in with runs makes him indispensable for now. This also takes upcoming leggies like Karn Sharma out of the equation. If at home, a third spinner is indeed required (which would logically mean a left armer) then it’s back to toss up between Ravindra Jadeja and Akshar Patel. Ishant aside, the pace attack didn’t have much to show. Ishant picked fifteen wickets, had lot of steam, looked better built (probably spent long hours at the gym over past few months), stayed injury free and was running in hard. Once Mohammed Shami is fit, these two should form our attack at home turf. Umesh Yadav is a quality third seamer to have knocking at the doors. Is Binny cut out for this level? No. At best he was an economical bowler (only with new ball) and flashy (read: lucky) batsman in this series. But into our third decade, we are still obsessed with searching for any imitation of one Kapil Dev. Irfan Pathan, after a long rope, is found these days dancing in television reality shows. Binny isn’t cut out for this level. No way. Saha had the third highest average amongst Indian batsmen this series – that’s not saying much in a disappointing series for our hyped batting lineup. Naman Ojha’s batting, though, has some added flair. Personally I have been disappointed with Saha’s batting in matches which mattered the most – while at a winning position in Adelaide 2014 and Galle 2015. Experts say his keeping is better, else there is little to choose between the two. Both are similar aged (on wrong side of thirties) and similar first class batting averages. It will be unfair to drop Saha, hence Ojha should remain the deputy despite clamour from many lobbies to include him. Rahane has had just one innings of note and four single digit disappointing scores this series. His century came as one down batsmen, so the debate is still open if he should be sacrificed from his regular middle order slot. Rahane’s 17 Tests have seen an average of 46, while Rohit’s 13 Tests have yielded 37. The team management has clearly shown an obsession to fit Rohit into the playing eleven, come what may. Rohit has the x factor especially in home tracks, but Pujara at one down, Rahane at middle order exudes more stability and confidence. There is a strong fear that Rahane is getting the Pujara treatment and that is not good news for Indian cricket. Finally, a thank you to Sri Lanka for preparing fascinating wickets for the entire series. Each of the wickets gave equal assistance to seam and spin, equal help to solid batsmen and bravado stroke makers, no 400 innings scores, plenty of twists and turns, all Test matches open till the 34th wicket was down; and the series was open either way till the last session of the last day of the last Test match. Well done SLBC. This series was no comparison to the overtly one sides Ashes Tests. Previous Previous post: Phantom Review : 5 Pointer To Watch It or Not!